A couple of months ago my kids and I were school shopping and decided to stop at The Cheesecake Factory for lunch. 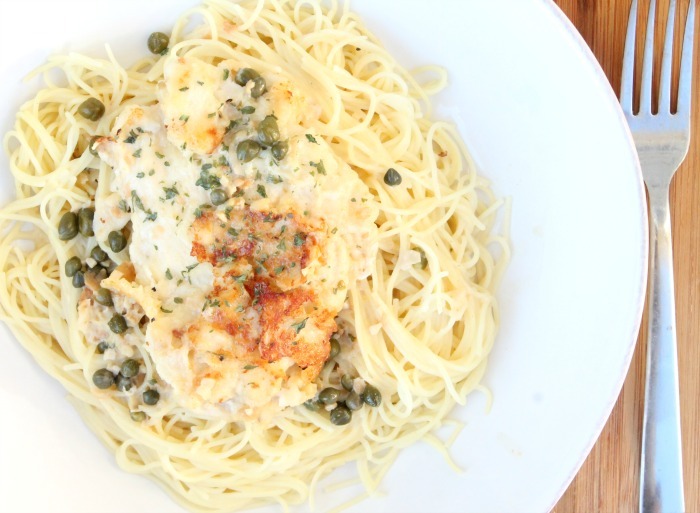 Now normally I get something light for lunch but this Lemon Chicken Piccata on the menu was calling my name. But I’ve got to be honest. 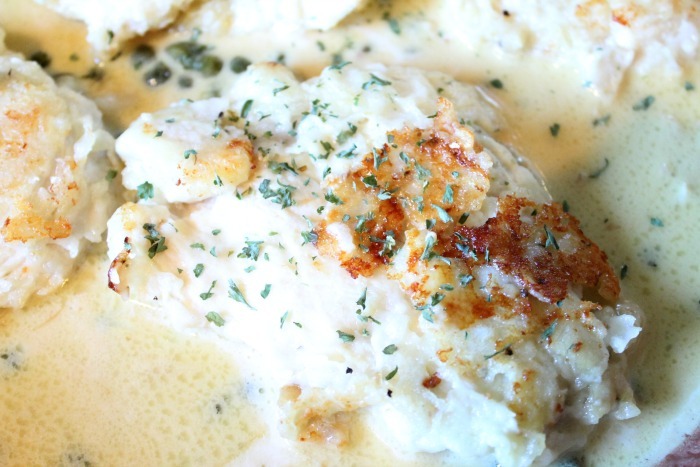 Up until this point I’d never had lemon chicken piccata so I wasn’t sure what to expect. I knew that I liked lemon and chicken so the combination just sounded really good. But wow! That Lemon chicken Piccata was one of the best chicken dishes I have ever had. I’ve been dying to have it again but instead of going out to a restaurant I decided to try and make it at home. 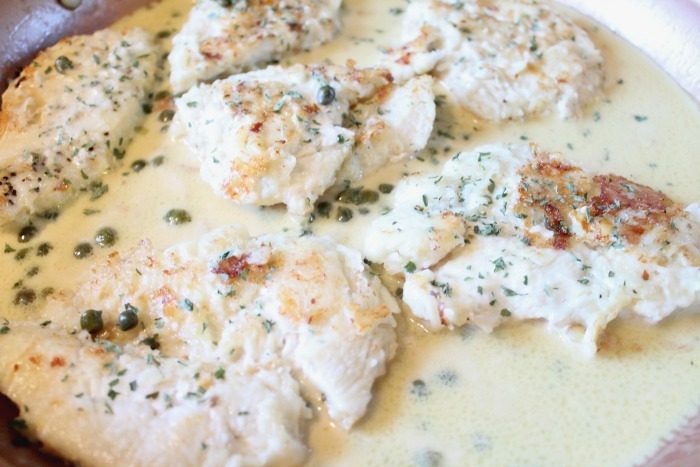 This Lemon Chicken Piccata is really quick and easy to make. From start to finish I had it done in around 30 minutes. The most time consuming part was cutting the chicken up and that was only time consuming because I had to wash everything after I cut it up. Cut the chicken breasts in half length wise. Make sure that they are thin. Season with salt and pepper and then one by one place the chicken in the flour mixture and lightly dredge. Shake off the excess flour. In a large skillet or pan,( I use this one) melt 2 tablespoons of butter and 2 tablespoons of olive oil over medium heat. Once the butter is melted, add the chicken pieces to the skillet and cook for about 4 minutes on each side or until the chicken is cooked and golden brown. Remove the chicken and set aside, but keep warm. In the same skillet melt 2 tablespoons of butter. There will be browned bits that you can scrap off the bottom of the pan. This adds extra flavor! Once the butter is melted add 1 tsp of minced garlic. Mix together with the butter and cook for about 2 minutes, stir frequently. Add the lemon juice, lemon zest, chicken broth and capers. Cook for about 4-5 minutes stirring occasionally. Gradually add the heavy whipping cream to the mixture, making sure you whisk it together. (Here is an awesome whisk) The sauce will start to thicken lightly. Add the chicken pieces back to the pan and top with the chopped Parsley. Serve over a bed of angel hair pasta. The first time I made this recipe, I wasn’t sure if my family would like it as much as I did. Well, I’m happy to report that there were absolutely NO LEFTOVERS! My kids even came back for seconds which makes me one happy mama. 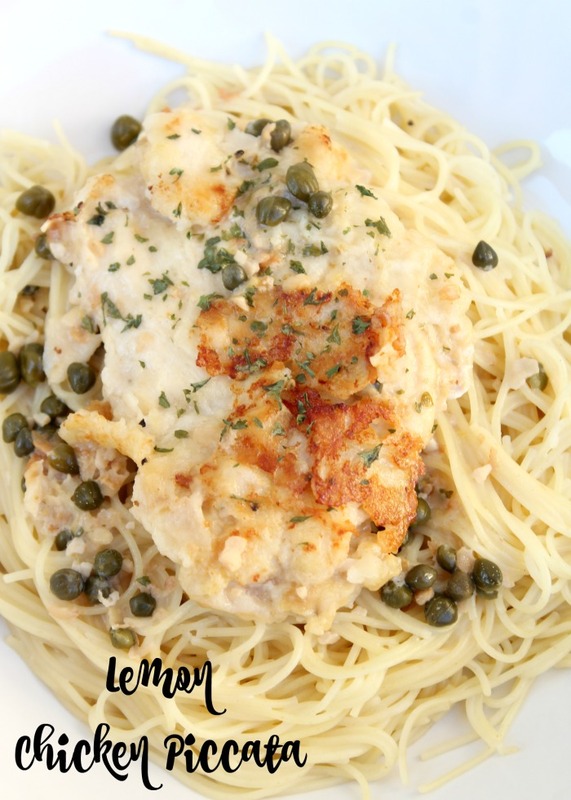 I will definitely be making this Lemon Chicken Piccata again very soon. It’s so quick and easy to make and a great dinner any day of the week.